Hey there friends. Let's start a daily fantasy basketball lineup thing! I love fantasy sports and while I don't consider myself to be an expert, I have been able to come out about even in my fantasy sports lineups. So, I've decided to share my lineups with you guys. Today, I'll just share the lineup, but going forward, I'll try to give a little insight into why I'm choosing those players. Hopefully, this series becomes something that you guys will love to see and will come back for more! 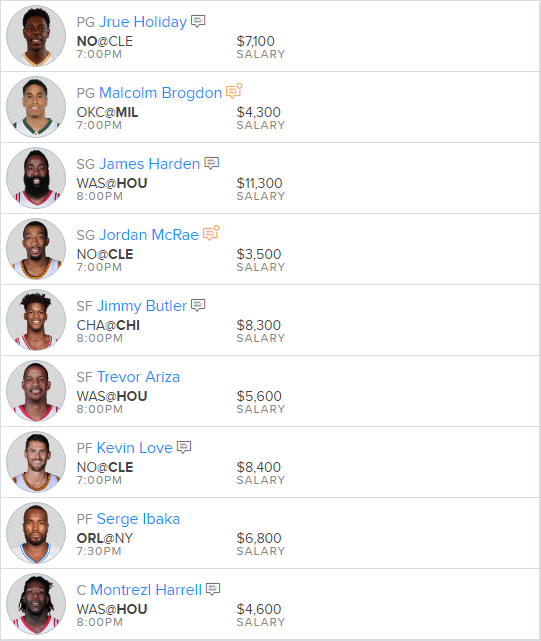 Just a little insight on this series: the lineup will be for the Fanduel website and it will be for the Main NBA slate! 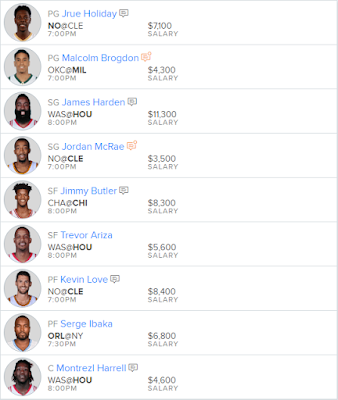 I will also try to have the final lineup go live approx. 30 minutes before the lineup locks, but I'll have my first lineup up early in the day.